In the final months of 2008, officials at Iceland’s central bank were figuring out where to turn for help, and pretty much all options were on the table: the Russians, the Chinese, the Americans, or some sort of international package. 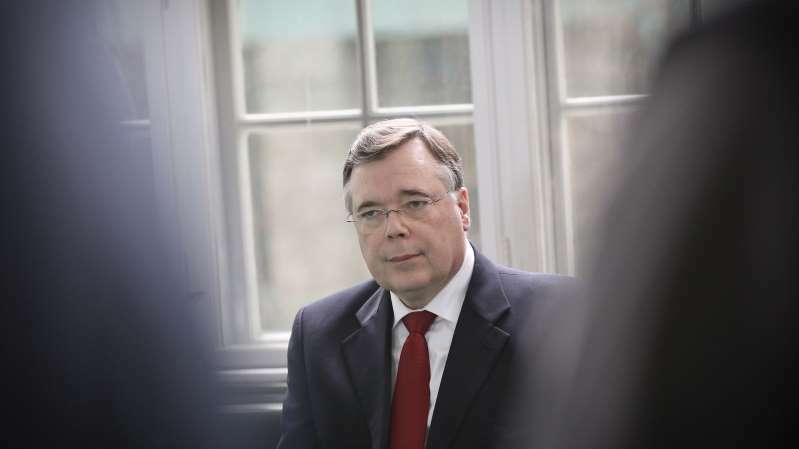 Sturla Palsson, a director in charge of international operations at the central bank in Reykjavik since 2005, recalls appealing to one of Wall Street’s biggest banks to help him convince Iceland’s prime minister, Geir Haarde, that the situation was dire and a rescue package was needed. He also recalls giving Washington, D.C., the impression that his country might be about to receive a 4 billion euro ($3.5 billion) loan from the Russians. "I will not deny that I was happy to make the Americans think that the Russians were going to lend us money,” Palsson said in an interview in Reykjavik. The credit line from Moscow never materialized. In the end, Iceland came under the protective wing of the International Monetary Fund. The timeline leading up to Iceland’s spectacular collapse shows the extent to which many key actors seemed not to realize how bad things were. The first bank to fold was Glitnir. As late as Sept. 18, 2008, it announced plans to expand in India. Eleven days later, it was taken over by the state, which bought a 75 percent stake after Iceland’s third-biggest bank lost access to short-term funding markets. Within a matter of days, Iceland’s two other biggest banks -- Kaupthing and Landsbankinn -- had also collapsed. Haarde would publicly acknowledge the true extent of the ruin facing his country on the afternoon of Monday, Oct. 6, 2008, in a televised speech that ended with the words: "Gud blessi Island" (God Bless Iceland). The shock waves were felt in the Netherlands and the U.K., where then Prime Minister Gordon Brown would ultimately invoke anti-terrorism powers to protect British customers of one of the failed banks. The apparent suddenness of the crisis belies the fact that a number of signs were building much earlier, for those willing to look. Palsson says the central bank had an inkling that not all was right back in 2005, when the market for medium term notes closed to Iceland’s banks. In February 2006, some rating agencies expressed "extreme concern" about Iceland’s banks and how ready they were to take big risks. Palsson describes this as a "very difficult" meeting in London. Just before their collapse, Iceland’s banks had balance sheets that were nearly 12 times the size of its economy. External debt had swelled to more than seven times gross domestic product. The current prime minister, Katrin Jakobsdottir, was a member of the opposition when the crisis erupted. She recalls having to take part in an emergency meeting at the central bank because her boss, Left-Green party chairman Steingrimur J. Sigfusson, was traveling at the time. "None of us expected this to happen so fast," she said over the phone. "It was a shock to all of us politicians." As it started to dawn on Icelanders that their country was headed for a full-blown crisis, they grew furious. People gathered on the streets to protest, grabbing their kitchen pots and pans and beating them with anything they could find to make as much angry noise as possible. Iceland is a small country in which the electorate takes its grievances straight to the heart of power. Many of the bankers who ran their institutions into the ground were jailed, bank creditors were cut off, and local authorities did everything they could to put a fence around the institutions they needed to keep up and running to survive the crisis. Even Haarde was put on trial for his role in the crisis, though he was ultimately acquitted of the most serious counts. Lars Christensen, a Danish economist who was advising the central bank at the height of the crisis, recalls how shocking it was to see his forecasts play out in real life. “Forecasting a GDP drop of 10 percent is very different from seeing GDP drop by 10 percent. When it happens, it’s not about numbers anymore but about people losing their jobs and selling their homes." After all the drama, Iceland’s recovery is now hailed as a success story. The economy has diversified away from finance, relying more on industries like tourism, state finances are back in the black and the banks are back on their feet. Haarde says Iceland deliberately adopted a "consumer-friendly approach," in which depositors, rather than investors, were safeguarded. He says Iceland’s model ultimately inspired the European Union. For Finance Minister Bjarni Benediktsson, the whole turnaround is nothing short of an "incredible miracle."